Wildfire Games, an international group of volunteer game developers, has successfully applied to make 0 A.D. an associated project at an organization called Software in the Public Interest, Inc. (SPI). SPI is a non-profit corporation based in the USA, that acts as a fiscal sponsor to many open source projects, including Debian, Drupal and LibreOffice. This means SPI can accept donations and hold funds for the development of these projects, sign contracts on behalf of the developers, provide legal advice when they might need it and more. 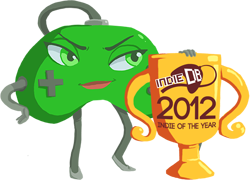 0 A.D. has just won second place in IndieDB’s Player’s Choice for Upcoming Indie of the Year contest for 2012. Thanks so much to all the wonderful fans who voted for us! This is a huge vote of confidence in the project, and a huge encouragement for the developers. With your help, we hope to make an even larger splash in 2013. And of course, congratulations to the winner, Path of Exile, which like 0 A.D., is entirely free of charge to download and play. Hats off! We have just conducted an interview with Jon from Cheerful Ghost. Nothing really new for people who have been following the project closely, but it covers all the basics for newcomers. jdodson: Do you want to believe in the Loch Ness Monster? Aviv: It would be interesting if what people saw was actually a relic of an ancient civilization in Loch Ness. Please Vote for Us Again in IOTY 2012! Just a few days ago, we made it once more to the top 100 indie games on Indie DB! Thanks for your support, but we need your help to vote for us one more time to win a top prize. Please vote for us in the second round of the Indie of the Year contest. Thanks in advance, and may the odds be ever in 0 A.D.’s favor. Welcome to the New 0 A.D. Website! Wildfire Games proudly presents the new 0 A.D. website, a new showcase for the game and FOSS project we have all grown to love. You’ll notice that the content has been redone, the design better reflects the interface within the game 0 A.D., and it is easier to get to download the version of 0 A.D. that is right for you. The new website is available on http://play0ad.com. Please point your RSS readers to the new website if needed. For those unfamiliar with the event, each year ModDB and IndieDB hold a contest for the best mods and indie games of the year. In previous years we have been nominated for the Editor’s Choice: Best Upcoming Indie (2008), won third place for Indie Game of the Year (2009) and received an Honorable Mention for Players’ Choice: Best Upcoming Indie (2010). Some initial amounts of four resources: Food, Wood, Stone and Metal. In 0 A.D., you need to gather more of these four resources, and then use them to train (create) various units at your buildings. In turn, you will need to put some of the new units to work gathering more resources and building more types of buildings. In this way, you build a strong economy with a constant income stream of all four resources, and prepare for building a strong military. As soon as possible, you need to train a large, powerful army, that can even include siege weapons and war ships. Training each of these military units costs the resources you gathered. Ultimately, you will send off your army to battle in an attempt to destroy all your enemies’ structures that can generate units, and all units that can construct buildings. The first player that achieves this goal, wins. Selecting objects: Left-click to select an object, such as a building or a unit. (Notice an outline appears on the ground at the base of the selected object.) You can select many objects at once by dragging the mouse. Tasks: If you right-click when a unit is selected, you tell it to do something. If you right-click an empty piece of ground: the unit will move there; right-click an enemy unit: it will attack it; right-click a tree, it will chop it to gather wood, etc. Moving the camera: Move the mouse towards an edge of the screen to move the camera in that direction and see more of the game world. Also: You can press the arrow keys (or the w, a, s or d keys) to move the camera. Rotate map: Either with Shift + Mouse wheel rotation, or with the Q and E keys. A full list of hotkeys is on the 0 A.D. Development Wiki. Food: Foraging from bushes and certain trees; Hunting certain wild animals or slaughtering livestock, such as chickens and sheep; Fishing; Farming. Stone: Mining from stone mines. When units gather a resource, there is only so much they can carry. Then they need to shuttle the resources they have gathered to a building that serves as their resource dropsite and drop it off there. Only then can they return to gather more resources. Civic centers and docks serve as dropsites for all four resources. Mills serve as dropsites for wood, stone and metal only. Farmsteads serve as dropsites for food. Units automatically shuttle the resources they have been gathering to the nearest dropsite that can accept it. It might be a good idea to build dropsites near their corresponding resources, to make sure your gathering units only have to shuttle short distances, which makes gathering more efficient.